We've created our Blue Cola electronic cigarettes liquid to taste just like one of America's favorite Sodas. Not only is our Blue Cola delicious and sweet, with every vape you'll get wonderful refreshment and all the enjoyment of an icy cold soda without all the caffeine and sugar. 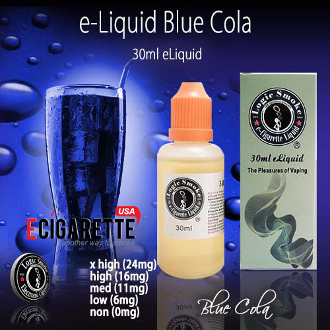 Any electronic cigarettes liquid collection is incomplete without our Blue Cola e cig liquid, order some today and enjoy.